I’ve been fortunate enough to visit quite a few historic Guild Halls in the City– the latest being the magnificent Draper’s Hall. The site of the Hall was vested in the Company by the will of Guy Shuldham in 1446. The Hall itself was burnt down in the Great Fire of London. Rebuilding began almost immediately and the Court held its first meeting in the new building in 1671. In 1822 Upper Thames Street was widened. The Hall lost some of its rooms, and was given a new facade and entrance gates. The present facade and entrance date from 1910. Attend a tutored tasting with Martin Everett MW from 12pm – 1pm focusing on a range of Burgundies. 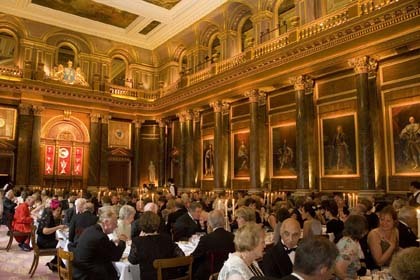 This will be held in an exclusive area of the Vintners’ Hall. Tickets are £20 in addition to a standard tasting ticket and places are limited. Winter Tasting Vintners’ Hall 16th November – Davy’s Wine Merchant.